The photographs on this Second World War postcard are of the NAAFI at Carlisle, Cumberland (now Cumbria). I have been told the Carlisle NAAFI was situated on Botchergate, at that time one of the main north – south thoroughfares through the city centres. Although I cannot remember this personally, during the years I was a ballroom dancer – in the 1960s and 1970s - my dance teacher had a dance hall studio on Botchergate, Carlisle. So it is a street I remember reasonably well from that era. Looking at the photographs of the Carlisle NAAFI during WW2 there appears to have been an excellent Ballroom as well as a Games Room, Cafeteria, Lounge and a Tavern. It was evidently a good place for servicemen and women to pass a few short hours with friends. As far as I can make out from these photographs there are Army Navy and Air Force personnel in the photographs. Interestingly, all the gentlemen leading their ladies around the dance floor in the Ballroom photograph appear to be in RAF uniform! I wonder if the ‘boys in blue’ were more of an attraction to the young ladies of that time….? This is a tribute to Callogero Marrone. A Catholic life-long anti-fascist, born of a middle class Sicilian family, he was the Head of the Varese Registry Office, and from there he issued a large number of false identity cards to Jews and to anti-fascists; indeed, it was his office that issued both my mother's and my ID card in 1944, obtained by my father, and, although we were British the cards certified that we were Italian. A minor detail, compared with the hundreds of Jewish lives he saved. 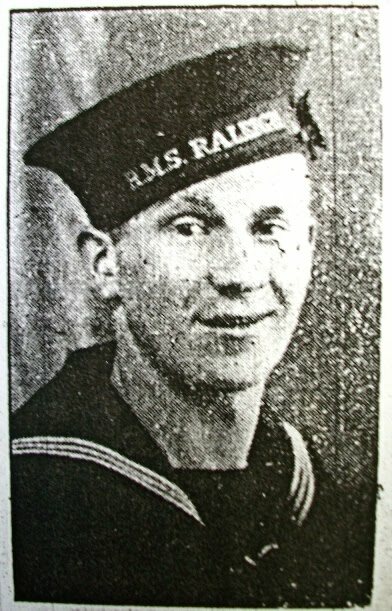 He was betrayed (it is believed by a fascist empoyed in his office) and arrested by the SS on 4 January 1944. He was held for nine months in a succession of prisons, first in Varese, where he was badly tortured in an effort to get him to reveal the National Liberation Committee network, but he refused to say a word. Then he was taken to a prison in Como for daily interrogation; then after a failed attempt by partisans to free him, to the notorious San Vittore prison in Milan. Here I am in my new residence, still as always in the best of health and high morale. I'm in a concentration camp for political prisoners where there is no lack of cool fresh mountain air to fill my lungs. There is a problem with not having woollen clothes, but you can't have everything, and I'll get used to it. Don't worry about me, I can truthfully say that the past nine months have strengthened my character. Suffice it to say I can now adapt myself to any kind of labour. I shall return with callouses that would honour any man. I've a ravenous appetite and the tar-black bread they give us seems like cake to me. ... If you could see how I'm now dressed you would burst out laughing: sheared like a sheep, a self-made paper hat on my head against the cold and the sun, a sort of overall with a large cross on the back and a red triangle on the front, the sign of a political prisoner, and underneath the number 4317, dirty shoes, and so on. But what is important is this: excellent health and morale as high as ever. I'm called 'the Philosopher'. Have courage and be constant. ... On Monday or Tuesday we shall be taken further north. Do not worry about me for wherever I go I shall know how to survive this foul bestial existence. For safety reasons, he signed smuggled notes with the pseudonym Peppo Coppula. Transferred to the extermination camp at Dachau, he died there of typhus on 10 February 1945. In happier times with his family in the 1930s. Callogero with his wife, Giuseppina. 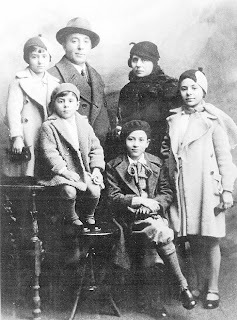 Their four children from left to right: Dina, Domenico (youngest), Salvatore, and Filippina. 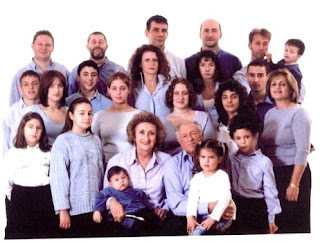 The elder son, Salvatore, seated with legs crossed, could not join the partisans so as not to compromise his father. When called up in 1944 he was smuggled to Switzeland. 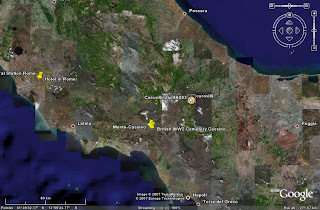 Domenico, 16 when his father was arrested, joined the “Poldo Gasparotto” partisan brigade, commanded by Luciano Comolli. 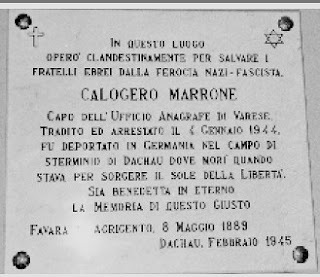 At this site Callogero Marrone, Head of the Registry Office of Varese, operated clandestinely to save our Jewish brothers from the Nazi-Fascist ferrocity. Betrayed and arrested on 4 January 1944 he was deported to Germany to the extermination camp of Dachau where he died just as the dawn of liberty was breaking. May the name of this righteous man be blessed for all Eternity. In another posting on this site I tell of my pleasure in meeting Sir.Nicholas Winton who is world famous for his wartime work in the saving of the lives of Jewish children. One of the books about his exploits is sub-titled "Save one life, Save the world" and this is in fact taken from the Talmud and says, in effect, if you save one life you are also saving all the future generations that follow from that life. I recently obtained a copy from Italy of Giuseppe Bastianini’s memoirs, first published in 1959 by Vitagliano, a small Milanese publishing house, republished in June 2005 by BUR Saggi under the title “Volevo fermare Mussolini”. 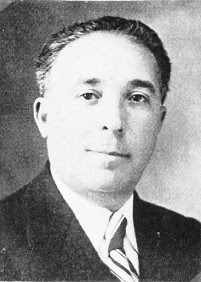 Giuseppe Bastianini was the Italian Ambassador in London 1939-1940. 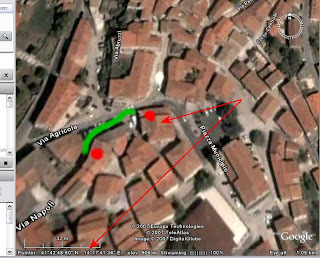 Subsequently he was governor of Italian occupied Dalmatia. He then succeeded Ciano as Foreign Secretary. In July 1943 he voted for the Grandi motion which led to Mussolini's fall. In early 1944 he took to the mountains, a wanted man by Germans and Republican fascists. At the Verona trial of Ciano and others in 1944, he was condemned to death in absentia but managed to cross the mountain border to safety in Switzerland. In 1947, having returned to Italy, he was arrested living incognito in Calabria and put on trial in Rome for his Fascist past, but absolved and acquitted. He died in Milan in 1961. In 2003 he was honoured, along with other Italian Fascist diplomats and military personnel, in the Israeli documentary 'Righteous Enemy', screened at the United Nations, for his part in saving over 40,000 Jews in Yugoslavia, whilst he was governor of Dalmatia, by issuing false documents and helping them get to Switzerland [he himself says he halped about 2,000]. I initially posted this on another site and then thought it might cause some interest here. I am reminded of the only experience I ever had with a misfire. It was in Jan 1945 and I was being re-trained as tank-crew at Rieti in the centre of Italy. We were firing 75 mm rounds from a Sherman Mark IV and had just loaded HE in the normal manner, that is, I, as loader, had just punched the shell into the breech and swung away to my left to avoid the recoil from hitting me in the shoulder. The gunner kicked the pressel switch, I did my "swinging" action but NOTHING happened. Panic all round and then the three of us shot out of the turret hatch and madly scrambled away from the tank. "Where do you think you're going ?" bellowed the instructor and with much embarrassment (and not a little fear) we had to retread our steps, get back in the turret and go through the procedure of getting rid of a dud round. I still go cold at the memory and offer up a belated hymn of praise to all the instructors who faced death daily because of their students stupidity. The 78th Div just won't lie down ! I have recently made contact with an Italian family who came from the hill town of Carovilli where 78 Div was "snowed in" during January 1944. I have also, through the good offices of Peter, managed to send a letter to the commandante of a barracks in Trieste asking if I may visit there later this year. In the course of this recent correspondence I have spent much time looking at war diaries of the 49th LAA and their position in the 78th Div and now have a question for Tom. Do you know who the various Div commanders were and where did Keightley fit in? Snow is back in Cockfosters ! However, with our now long list of links it seems to me to be more convenient to add then at the top of the list. They are readily visible and it saves scrolling down. It also saves me having to draw your attention to a new link in a post.